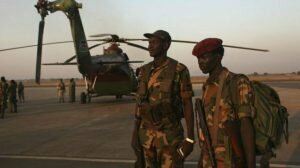 Juba/Addis Ababa, April 15, 2017 (SSNA) — South Sudanese government has dropped containers of toxic gas on rebel-held areas in Bieh State, a senior rebel military source told the South Sudan News Agency on Saturday. The official who declined to be named because he is not authorized to speak said the government used at least three military helicopters to drop the poison gas. “After days of failed attempt to capture our areas in Waat, the genocidal regime in Juba decided to use poisonous gas on our gallant forces and civilians. The gas is suffocating people. People affected by this gas attack are experiencing severe coughing,” the officer told the South Sudan News Agency. Lt. Col. Lam Paul Gabriel with the SPLA-IO military command also released a statement, confirming the gas attack. Gabriel said rebel forces have tactically withdrawn from Waat Saturday night to focus on civilian evacuations. “There are many civilians casualties in Yuai and Waat due to this act of terrorism by the Juba regime,” he said. The armed opposition calls on the African Union (AU), Troika countries and the international community to immediately send investigators to Bieh and Akoba states to investigate what it described as “this use of poisonous gas by the Juba regime.” The SPLA-IO urges the international community to send a medical team to the affected areas to treat those affected by the alleged gas attack. One senior rebel official in the Ethiopian capital, Addis Ababa, told the South Sudan News Agency today that the armed opposition intelligence branches have evidence showing Ugandan government is secretly assisting South Sudanese government in the gas campaign. Chemical and biological weapons or ammunitions​ are not sold to third world countries like South Sudan. Only Libya under Qaddafi had poisonous gas which it didn’t purchase overseas but manufactured it. After qaddafi lost power, the overseas invaders destroyed chemical weapon stockpiles and took the technology used to make them. In addition Libyans​ lost peace, stability and oil wealth. The country is now chaotic. The international communities doesn’t care about the death of thousands of Nuer or the death of others south sudanese tribes but they do care about the jieng people who are currently destroting the young country and its people with help of other African brothers. In this to days’ world many countries makes living by sucking other peoples’ bloods. For this fact ,iam advising our south sudanese citizens who become victims and still be victimized by the very regime in juba, let take the Rwanda suite to releave ourselves from this fate and forget about complain that will bring us no help. Lets’ keep focusing on how to challange the regime in juba. Lets’unite our ranks and file and match forward to topple down that terrorist regime in juba. Unity is our strength, without unity, no success. If no success,then our people will suffer alot . You tried it and did not work. Try it again and you will finish. SPLA/IO Need to understand there is no help else will be there in South Sudan. SPLM/IO Need to put their hand on anything to defeated the Juba genocides regime by getting weapons or chemical weapons too as well as defeating Slava Kiir so called the useless, none visions leader tribalism genocides president of South Sudan. No country in the world is mad to give or sell chemical weapons to the SPLM-IO or the SPLA-IG. Kiir should be held accountable to the ongoing genocide in SS. Sooner than later, Juba war mongers should fall down and smell the coffee. They can’t go scot free. No. l appeal to all non Dinkas in SS to integrate and put the blood sucker regime under siege. The Dinka tribe is too small for SS and the country is not their property. Viva Cde Machar et al, don’t ever let the regime scot free. Defend yourself at all cost and l want to assure them that African Union failed not only SS but many nations. Look what Uhuru Kenyatta is doing. They all don’t care about peoples lives, so defending yourself is the only option. You can’t fold your hands whilst your people are being slaughtered everyday under the watchful eye of all World leaders. No. Kiir has no license to kill South Sudanese. No. If AUs conspiracy issued him one they must withdraw before he falls down. At this juncture I’m happy to note that the likes of Museveni saw the light and hopefully, he shall cut Juba support immediately. Lastly,Mogae and associates soiled their standing in SS by siding with Kiir, therefore they should do SS favour by quiting their conspiracy job. Without any shadow of a doubt, he is now part and parcel of Kiir, hence his continued stay in Juba is a waste of time and resources, otherwise he shall face the same fate with his African fellow, barbarian, Kiir. World leaders nowadays focuses on sacrifice. No cry or wailing because you are still very strong. International community are not able to stop poisonous gas against rebels. Let them sneeze and cough to taste it. How shameful is this government?How can a government use a systematic poisons against its own citizens.As a South Sudanese citizens, we are calling up on INTERNATIONAL COMMUNITY and all other human rights agencies to argently turn to such matter and investigate it.South Sudanese have been dying since 2013 December and no action that could cease that death from International Community.We are particularly calling up on UN Secretary general to take rescue action on South Sudanese citizens. Non-Dinka and level headed Dinka must unite to rescue the country from these Gogrial devils. I wonder if Salva Kiir and his JCE are genuine South Sudanese because if they were they would not have used chemical weapons against fellow citizens. The war they are now fighting is now for occupation therefore citizens must rise up to the challenge of freeing the country. You the ones destroying the country of South Sudan for following leader Riek Macher. If we all stop fighting now South Sudan will be peaceful. Yeah got to think sometime what will benefit people and the rest of South Sudanese people. Because sometime fighting with gun can’t never win the war. People gotta to talk peacefully or election and peaceful protesting so your voice can heard. Brother Ochang Basroba what are talking about. Riek Macher went to Juba to implement the peace which was signed. Salva was the one who was not for peace, he put an necessary reservations. At the end he planned to kill Maher. You have to be a sensible human being. With people like you is why South Sudan is in chaos. Bro you have so spoken than these idiots calling for the death. Death don’t discriminates. We need to find solutions to our problems using a peaceful means not gun or trying to blame one party or the other. Riek and kiir are enjoying what they sow. What of mere citizens? Better denounce violent since it is the only last refuge of incompetents. Call for peace has fallen on deaf ear. New dawn of all out war across South Sudan is on horizon. let’s focus on this, it is time. No women no cry. Satan the devel lead SPLA.IG and SPLA.IO into ashes because they use chemical weponse and posoinius gas to kill inocence people. Our leaders please, stop lauphing the suffering of civilian and trying to bring down the comanders who are in the field give them advice tell them also to advice their forces not to take up posoinius weponce to kill each other specialy civilian if you kill all this, who will you rule? May the powers of that that brought us into this world guide us, protect us and provide us with the necessary knowledge, wisdom and courage to unite both the IG and IO, for we are ONE [South Sudanese]. By the way, in a battle situation, God is on both sides…. it’s a big shame on south Sudan to use poison gas to his armies. later on ,who will be a victim ? u South Sudanese u will be a victimized of those poisoners gas that ur using in ur land. You are right and even when the war is done and they killed everybody in Sudan you would they rule? Rudolf Ogoo Okonkwo is the author of “This American Life Sef!” our African brothers saying the facts as they are, I am telling our Dinka brother this man, Salva Kiir Mayardit is tarnishing the name of very important people (Dinka) in South Sudan as to be bad and murderers like what he is doing…!!! There is no physical prove of using chemical weapon and doesn’t make sense because the country’s economic situation in decreasing. Then how they get the money to buy these destructive weapon ? There is no physical prove that the government had used chemical weapons in the current war if so then instead of buying guns and weapons better to deliver services to the effected citizens and the current GDP is 2 billion dollars a year so it will be impossible. This country is not for tribalism so my bros if you confesses to your nation who will wake her up????????? Chemical weapon is a much weapon for destruction. It is made to destroy a specific area comprising a huge number of people. The government of south Sudan of the so call SPLA should not have applied this method in the war.